Also - writing! I am more than pleased to have had not one but three pieces published over the past couple of months starting with my poem “The Orange X” in the online literary magazine (you gotta scroll - yep, keep scrolling), The Writer’s Café Magazine. I’ve also written my first ever review on the latest novel by Nova Scotia writer Carol Bruneau, A Circle on the Surface, published in Understorey Magazine. 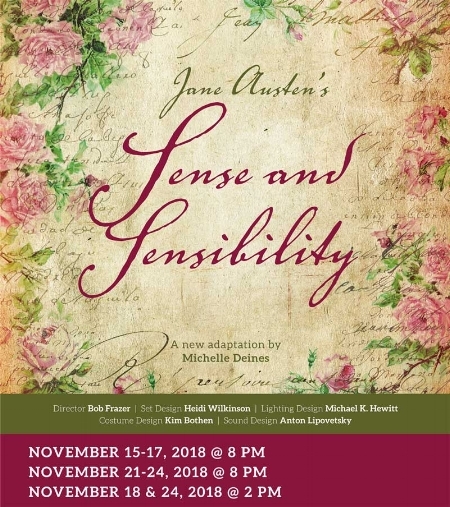 Looking ahead to this autumn, my new stage adaptation of Jane Austen’s Sense & Sensibility will be produced at Capilano University as the first show in the Theatre Department’s 2018-2019 season. The production will be directed by intrepid Vancouver actor and director Bob Frazer, who will lead a fantastic design team, which includes Heidi Wilkinson (set) and Anton Lipovetsky (sound & music), and our ensemble of actors from the university’s Theatre and Musical Theatre Departments. We’ll be starting rehearsals in less than two weeks and can I just say…this is all pretty darn exciting. I get to work with some wonderful artists, and as playwright I’m working with the divine words of Jane Austen. Can’t get that much better. I’m very much looking forward to seeing our Capilano students bring her story and cast of characters to life.